There’s no question that the midterm elections strengthened our position in the CT General Assembly. Candidates strong on gun violence prevention outperformed their opponents in both the House and Senate. Now a special election is being held on Tuesday, February 26 to fill the open seat in the State Senate 5th District. It’s important we hold this seat that was vacated by Senator Beth Bye, a long-time supporter of strong gun safety laws. 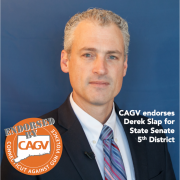 CAGV is pleased to announce that we have endorsed Derek Slap for the 5th State Senate district. Like Senator Bye, Representative Slap has been outspoken in his support for common-sense gun laws. He voted to ban bump stocks last year. But even before he joined the legislature, Derek Slap was involved in gun safety legislation. As Chief of Staff for the Senate Democratic Caucus, he helped to draft the landmark gun safety legislation that passed after the Sandy Hook School shooting. Because they don’t get much attention, special elections are often overlooked or considered unimportant because they are in safe districts for one party or the other. 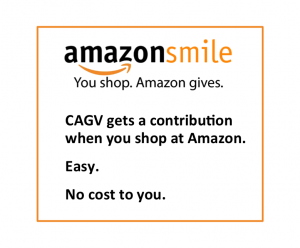 Don’t be complacent! If you live in the 5th Senate District (Burlington and West Hartford, and portions of Bloomfield and Farmington), please go to the polls on Tuesday, February 26 and vote to elect Derek Slap for State Senator representing the 5th district.